These easy and delicious no-bake ice cream sundae cupcakes are a fantastic sweet summer treat! 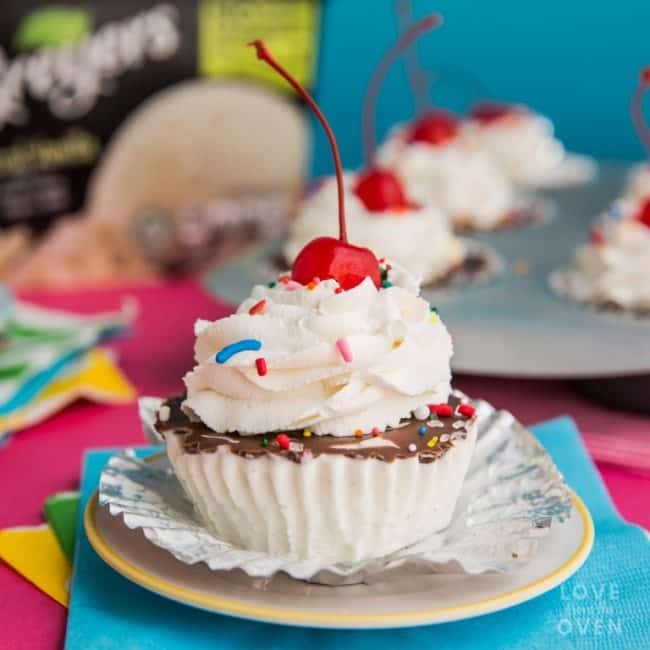 These no-bake ice cream sundae cupcakes are an easy and delicious way to make your summer a little sweeter! July is National Ice Cream Month, and I think that is a great reason to celebrate! 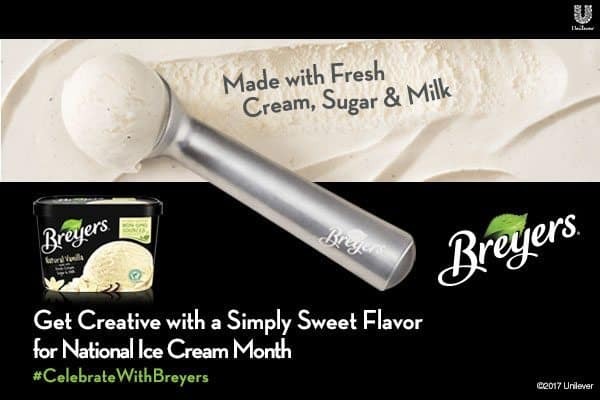 Thanks to Mirum Shopper for sponsoring this post on behalf of Breyers. It’s so hot here in Phoenix that I just can’t bring myself to turning on the oven these days. 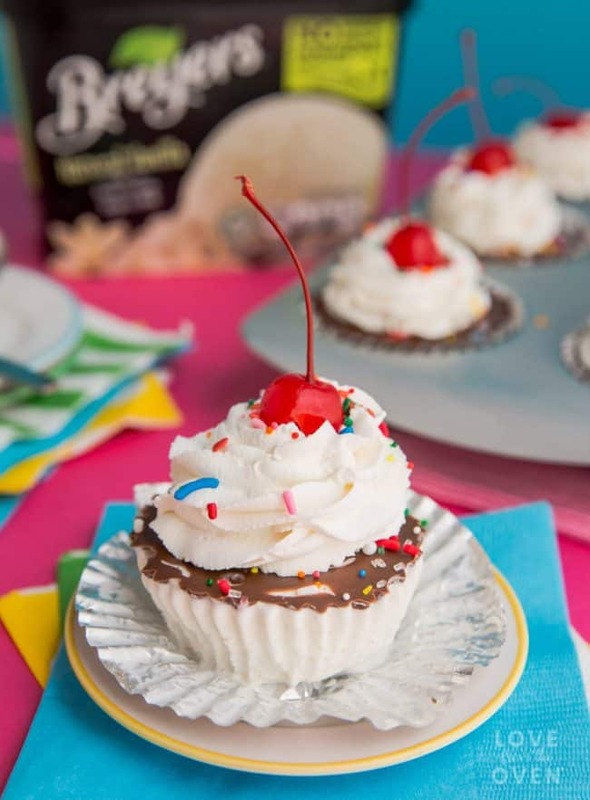 No problem here – these cute little ice cream sundae cupcakes are completely no-bake. Truth be told we like to celebrate all year with ice cream. We have a tradition of celebrating the first and last days of summer with ice cream, and we pick a day each summer where we have ice cream for breakfast (followed by healthy foods the rest of the day). My kids talk about that one day all year long. I love that something so simple and so easy is so special to my family. My freezer is always stocked with Breyers Ice Cream from Walmart. 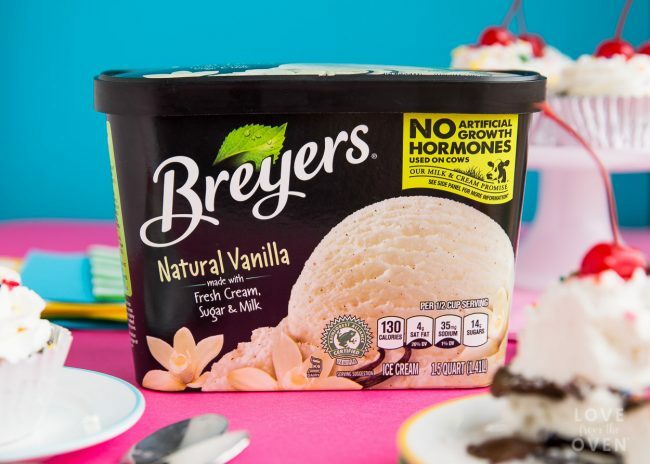 Made with fresh, high quality ingredients like cream, sugar and milk, Breyers Vanilla Ice Cream is a delicious treat that I feel good about serving my family. I love that it is non-GMO and the flavor reminds me of the homemade ice cream my dad would make when I was a kid. 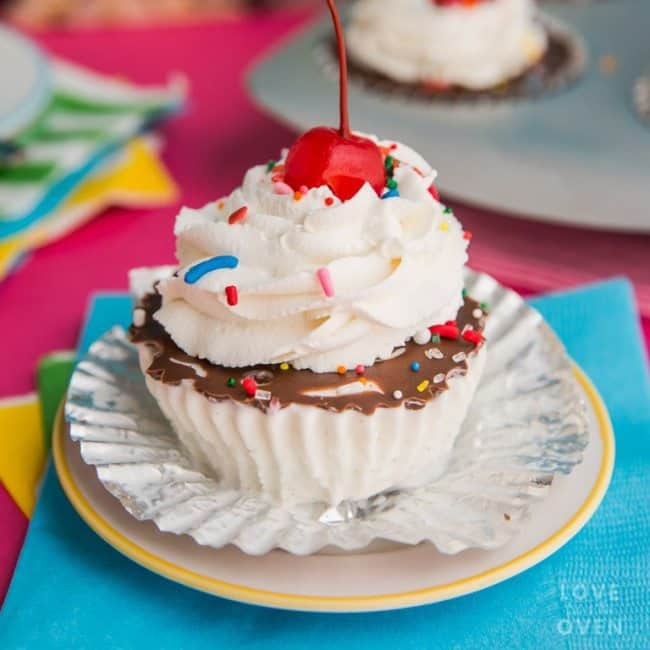 Then you simply layer your items together in your cupcake liners. I usually get my Breyrs Ice Cream out first and allow it to soften a bit while I gather the other items. 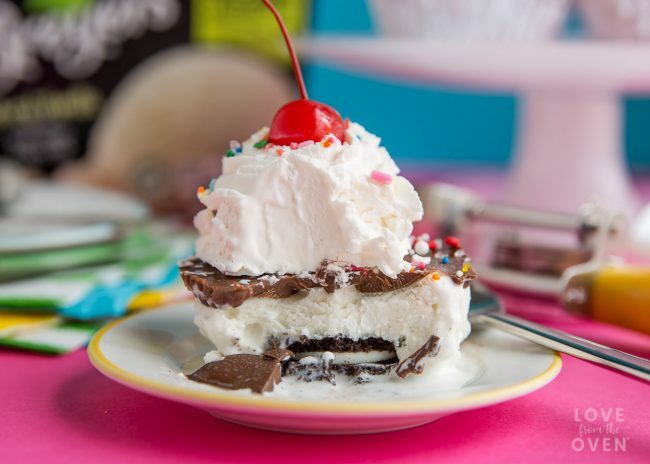 First you add your cookies, then your ice cream, then ice cream topping, followed by whipped cream, sprinkles and cherries (and you can even skip those last three if needed). Once assembled they go into the freezer for at least two hours, then are ready to serve! If desired, you could crush your chocolate sandwich cookies and mix the cookie crumbs with some butter to make mini crusts for these. That’s a delicious way to go, but if you are looking for quick, easy and only want to make a few cupcakes, using the cookies whole keeps it simple. 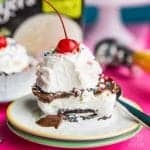 Easy and delicious no-bake ice cream cupcakes! Line a cupcake pan with cupcake liners. Place one chocolate sandwich cookie in the bottom of each cupcake liner. Place a 1/3 cup scoop of Breyers Natural Vanilla Ice Cream on top of each cookie. Gently smooth ice cream down to create a flat surface. Top with a spoonful of chocolate ice cream topping. If desired garnish with whipped cream, sprinkles and cherries. Place in the freezer for at least two hours, then serve and enjoy. I hope your family has fun celebrating National Ice Cream month, as well as little everyday moments, with ice cream! Remember to head here to save 75 cents on Bryers Ice Cream at Walmart! 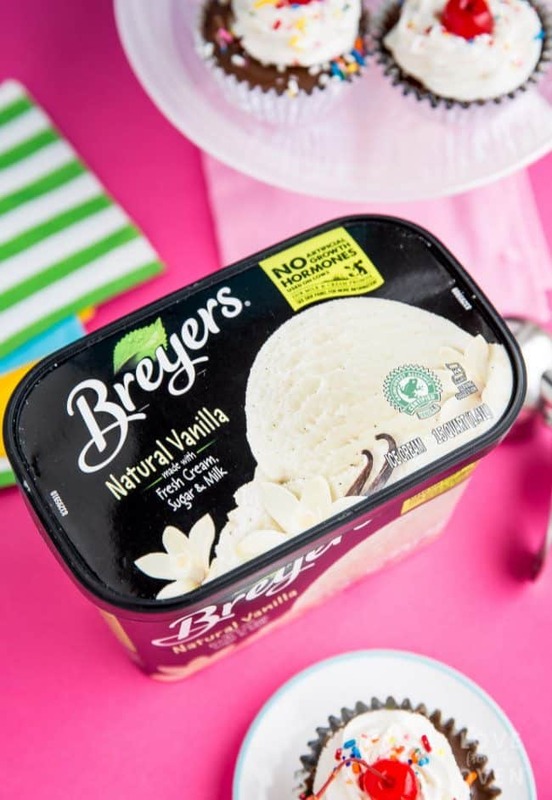 We are huge fans of Breyer’s Natural Vanilla ice cream! I cannot wait to make these cupcakes with my daughters! So fun! These look soooo good! It’s currently Winter here in Australia, but that doesn’t mean I haven’t been celebrating Ice Cream Month in my own way (eg. lots of ice cream-shaped treats)!